Cruel and Inhuman or Necessary? Personal Stories of Preemptive Prosecution Part II: A Call to Action! Get on the Bus & Say No to Racism and Bigotry! Read Carl Strock's excellent column about the Newburgh 4, published in the Daily Gazette, June 21, 2010. Friday, May 28th, 9:30 A.M. to 11 A.M. Listen here to Fahad Hashmi's brother Faisal explain plea on Democracy Now! Whose justice? 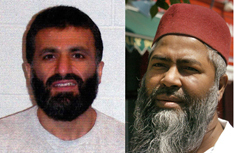 Preemptive prosecution in the "War on Terror"
This web site is devoted to researching and documenting the likelihood that the United States Justice Department’s post-9/11 terrorism-related prosecutions and convictions have included a significant number of Muslims who were in fact innocent of any crime. Other cases were severely overcharged and/or over sentenced. Read more . . .
We are members of the Albany-based Muslim Solidarity Committee, the national Project SALAM (Support And Legal Advocacy for Muslims), and the national Coalition for Civil Freedoms. We grieve with the families and friends Read more . 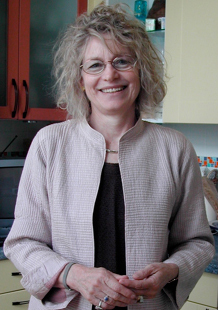 . .
SoundCloud interview with Kathy Manley, Esq. regarding Shahed Hussain, the FBI informant and the tragedy in Schoharie, NY. Democracy Now! 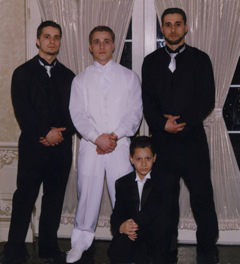 report on the tragedy in Schoharie, NY and the FBI informant, Shahed Hussain. 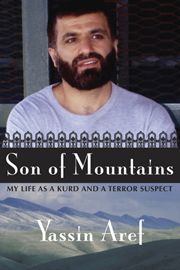 Learn more about the wrongful prosecution of Yassin Aref by listening to the podcasts, Terror Talk. Who are the Dukas? They are three brothers who Read more . . .
Tarik’s case is an example of preemptive prosecution: a law enforcement strategy, adopted after 9/11, to target and prosecute individuals or organizations whose beliefs, ideology, or religious affiliations raise security concerns for the government. "Victims of America's Dirty Wars." The Muslim Solidarity Committee, Project SALAM, and the Aref-Hossain/Albany chapter of the National Coalition to Protect Civil Freedoms (NCPCF) invite all media to a press conference on Tuesday, December 3 at 11:00 a.m. at the new section of the Masjid As-Salam, 280 Central Avenue in Albany. Read More . . . Speak out at the Albany County Legislature on Thursday, December 5 at 6:15 PM. Read More . . .
Everyone is invited to attend, read more . 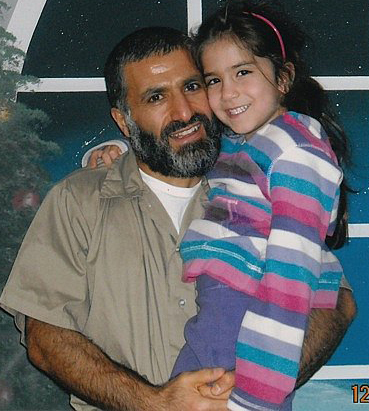 . .
Yassin Aref holds his youngest daughter during a rare prison visit. Sign a petition to the judge in Yassin Aref's appeal. The Journey for Justice will deliver the petition by walking from Albany, New York to the judge's home court in Binghamton, New York. At the Unitarian Church of Staten Island, 312 Fillmore Street, Staten Island, NY 10301. Free and open to to the public. Support our Muslim sisters as they protest how the Justice Department turned their relatives into political prisoners and buried them alive in federal prisons. Victoria Brittan reads from her new book and speaks on the issues. Book signing follows. 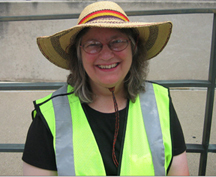 Thursday, April 11, 2013 7 p.m. at Westminster Presbyterian Church 85 Chestnut Street, Albany, Free and open to all Read more . . .
A press conference and vigil will be held outside the court house beginning at 8:30 AM. 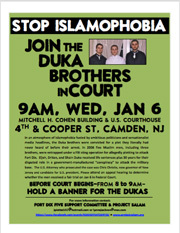 Monday, November 5 at 10:00 AM at the Federal Court House, 500 Pearl Street, New York, NY. 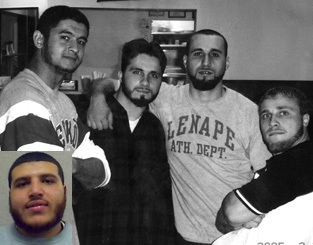 The four men from Newburgh, New York, were entrapped in a sting operation by the FBI, and sentenced to 25 years in prison. Read more . 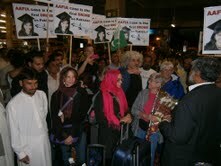 . .
Read the Report on the CodePink delegation to Pakistan by Joe Lombardo, UNAC co-coordinator. Joe Lombardo describes his trip to Pakistan and his meeting with the Aafia Siddiqui movement in Pakistan. Read Joe Lombardo's report. Vegetarian and vegan lasagna dinner, Wednesday, October 17, 2012 at 6:00 PM at 85 Chestnut Street, Albany. Read more . . . In June of 2012, the first ever and long over due hearing on solitary confinement was held in front of the Senate Judicial Subcommittee on the Constitution, Civil Rights and Human Rights. Read more . . . Here is a situation to think about regarding the monitoring and profiling of Muslims, or the war on terror, or whatever you want to call it. 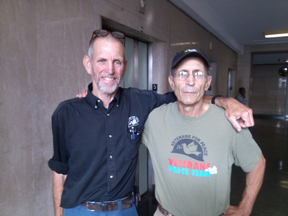 About a week and a half ago two Albany men active in defending the rights of Muslims — Steve Downs, a retired state lawyer, and Shamshad Ahmad, read more . . .
On August 21, 2012 I had my first encounter with the Albany Speech Police. I was hosting lunch in an Albany, New York restaurant with Dr. Shamshad read more . . . The candlelight march will begin at Townsend Park and end at the Masjid As-Salam, 278 Central Avenue, Albany. Read more . . .
presented by Lynne Jackson and Cathy Callan. Read more and viewlinks to reports. . .
Innocent Muslims are being targeted and convicted for crimes they have not committed. 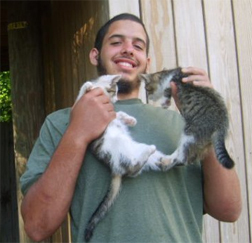 On September 19, 2011, a trial is scheduled to take place in New Bern, North Carolina––that accuses a number of individuals of terrorism, including twenty-one-year-old Ziyad Yaghi. We believe that only by observing these trials can fair-minded people decide whether the trials are just and the defendants guilty or innocent. . . . Read and download complete letter asking people to attend the trial . . .
of the Banda Rebelde, Antoine Dowdell, NYC jazz musician and brother of prisoner Tarik Shah, Sybil Allyson & Roots of Change with Roger Mock Read more . . . 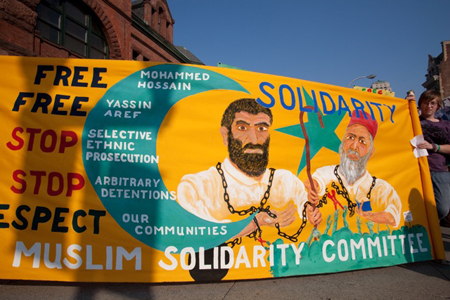 In June 2008, I attended a meeting in Albany organized by the FBI and designed to quell the growing fury over the arrest and prosecution of two local Mus lim immig r ant s , Yassin Aref and Mohammed Hossain. 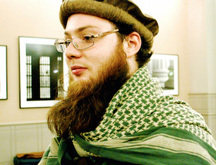 The previous year Aref and Hossain, both leaders at a local mosque, had been sentenced to fifteen years in federal prison in connection with their role in a terrorism scheme that the press had dubbed the Albany “missile plot.” Read the rest . . .
"Victims of Ameria's Dirty Wars"
"Victims of America's Dirty Wars" begins with the story of the FBI’s infamous COINTELPRO program of the 1960s, which targeted the Black Power and anti-war movements, and ends with the government’s attack on and repression of innocent Muslims in particular, but also peace activists, civil rights proponents, union organizers, environmentalists, animal rights advocates, and immigrant communities after 9/11. The story shows how the last decade has seen a dramatic increase in profiling read more . . .
Democracy Now! half-hour program. See the video - read the transcript. 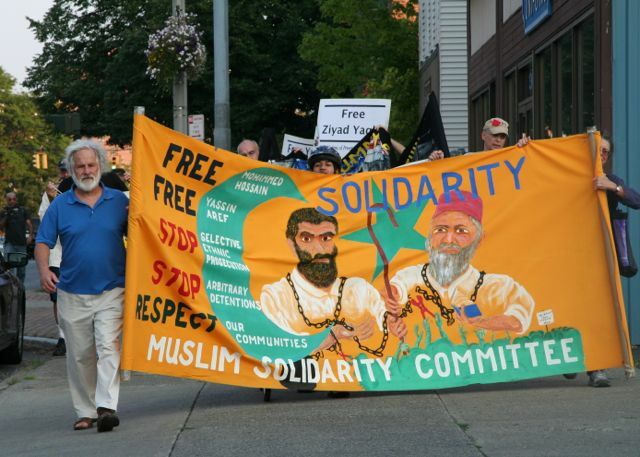 The Muslim Solidarity Committee in Albany, New York (supporting Yassin Aref and Mohammed Hossain) has now become the local “chapter” of Project SALAM. But the committee was founded in October 2006, and Project SALAM grew directly out of the committee’s four-year advocacy for Aref and Hossain. 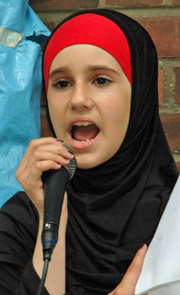 Here is a history of the Muslim Solidarity Committee, written for the United National Peace Conference in Albany on July 23–25, 2010, in the form of a downloadable booklet. Read about who we are, why we began, the background of the Aref-Hossain case, other Muslim prosecutions in Albany, and the committee’s activities year by year––and use it as a handbook for Muslim justice in your own community. The Albany City Council Passes the Resolution Asking for Justice for Muslims! Read reports on this historic report and watch a video of the event. 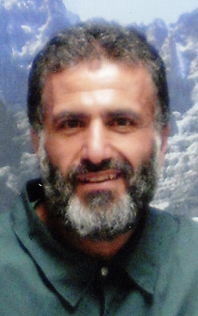 On Monday, April 5, the Albany, NY City Council passed a resolution entitled: "RESOLUTION URGING THE U.S. DEPARTMENT OF JUSTICE TO REVIEW THE CONVICTIONS OF MUSLIMS WHO WERE “PREEMPTIVELY PROSECUTED” TO ENSURE THEIR FAIR TREATMENT UNDER THE U.S. CONSTITUTION AND BILL OF RIGHTS"
Project SALAM asked for permission to file the first Amicus (Friend of the Court) brief in the case of Yassin Aref and Mohammed Hossain, Muslims entrapped by the FBI in Albany, New York. Click here to read the papers Project SALAM filed. 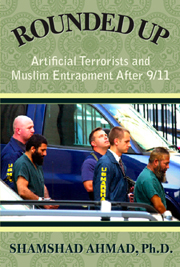 Read about Shamshad Ahmad's new book on the Aref/Hossian FBI sting and entrapment case, "Rounded Up, Artificial Terrorists and Muslim Entrapment after 9/11"
See the new review of Rounded Up featured on Truthout.org. (Please note: the petition is hosted by iPetitions. Please sign the seventh letter to President Obama and Attorney General Holder. This letter requests that the Justice Department deal with the serious issues of misconduct and illegal behavior in which the Justice Department has been engaged, including the failure of the Office of Professional Responsibility to discipline lawyers such as Yoo, Bybee, and Bradbury who committed serious professional misconduct in authorizing torture, and the Offices failure to discipline lawyers who fail to disclose exculpatory information (the Stevens case). Also discussed is the failure of the Department of Justice to take appropriate action in the cases of the CIA Agents convicted in Italy; the failure to turn over exculpatory information in the Samueli and Ruehle cases; the dismissal of charges in the Blackwater prosecution; the “loss” of 22 million emails from the White House; the cover-up of prisoner murders at Guantanamo; the manufacturing of emergencies to by-pass warrant requirements; the continuing torture program of the Obama Administration; the killing of Imam Luquman Ameen Abdullah, and the implementation of the Total Information Awareness system in violation of the Constitution and the Bill of Rights. Please add your signature as well. The truth is coming out about how the Bush Administration broke the law, lied about it, and covered it up on a massive scale. We know that justice was twisted and that innocent Muslim were convicted as a result. Soon the whole world will know. Please be part of this effort to force the Obama Administration to address the injustices that stain our nation's honor.